Sultan Ahmed Shah started the work of foundation of the city with the construction of Royal Palace. People call it- Bhadra Fort. 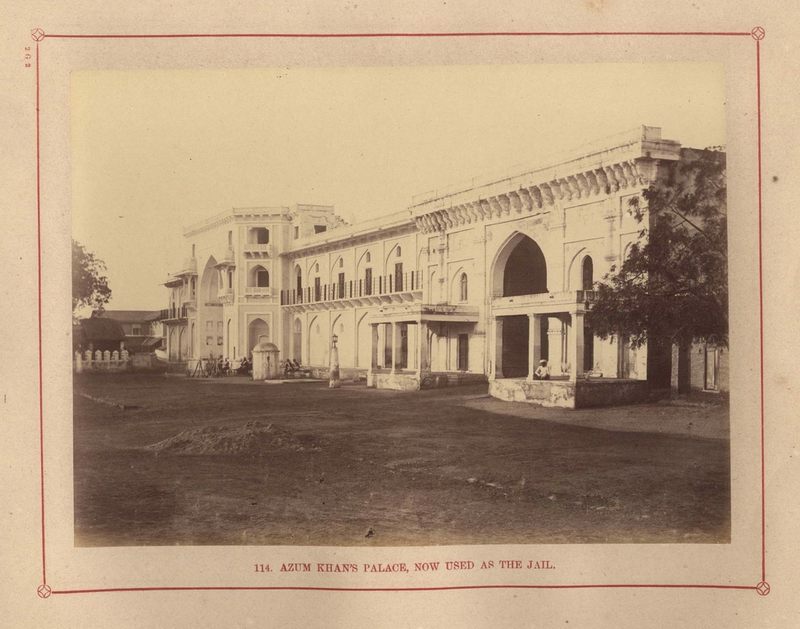 When the Sultan established Ahmedabad, he had in his mind Anhilpur Patan. He took it as a model for the capital. The fort of Patan was called Bhadra. Therefore Ahmed Shah also called his new fort �Bhadra�. According to �Mirat-e-Ahmedi� this fort is called �Arak Fort�. The total area of the fort was 43 acres and there were 14 circular structures. The structure that we can watch now is the incomplete �Manek Burj�. As Ellisbridge was extended, some of its portion was removed so a new form came into existence. The portion on the North East side wall was removed and Sidi Saiyed�s Mosque was constructed. Ajam khan�s Palace in the east was also constructed during Mughal period after removing some portion of the fort. The original Bhadra Fort had six big and two small gates. The main gate in the east is mentioned as �Piran Pir�s Darwaja�. We know it as Bhadra Darwaja. 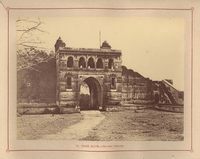 Another main gate was in the north of Bhadra Fort. It was called �Lal Darwaja�. At present, only wall of Lal Darwaja is in existence, which is seen opposite to road on the north of Sidi Saiyed's Mosque. The area opposite to Electricity House is known as Lal Darwaja. The third gate was in the south west. It was known as Ganesh Bari. The southern gate led to Ahmed Shah's Mosque. There were two gates of normal size at the spot where telegraph office exists today. There were two gates in the west, namely Baradari and Ram Darwaja. there was a well near Baradari Darwaja, which was used to provide irrigation to the garden. There was a royal garden within the Form known as 'Naginabaug'. 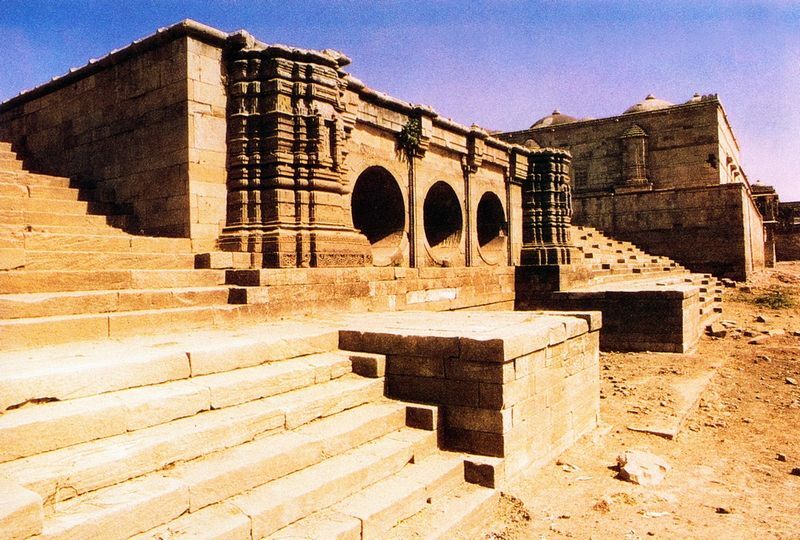 The royal Palace of Bhadra got damaged before Jahangir came to throne. A traveller, Mendelslow describe this fort as the biggest fort among the big states. 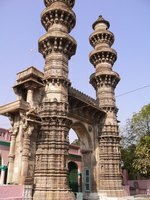 Ahmed Shah�s Mosque is in the south of Bhadra Fort and just opposite to Gujarat Club. Ahmed Shah started construction of this mosque in 1411, the year in which he laid the foundation stone of the city. The construction work was over by December 1414. The stone inscription in Persian language tells that it was built by Ahmed Shah placed in the mosque. This mosque is renovated recently. This mosque is situated near Astodia Darwaja built by Sipri, begum of Muhammad Begada in 1514. The begum�s name is mentioned as �Asani� in the references about construction of the mosque. Its balconies are grand, its carving is subtle like that of a haveli. Its slender minarets are solid and purely ornamental. 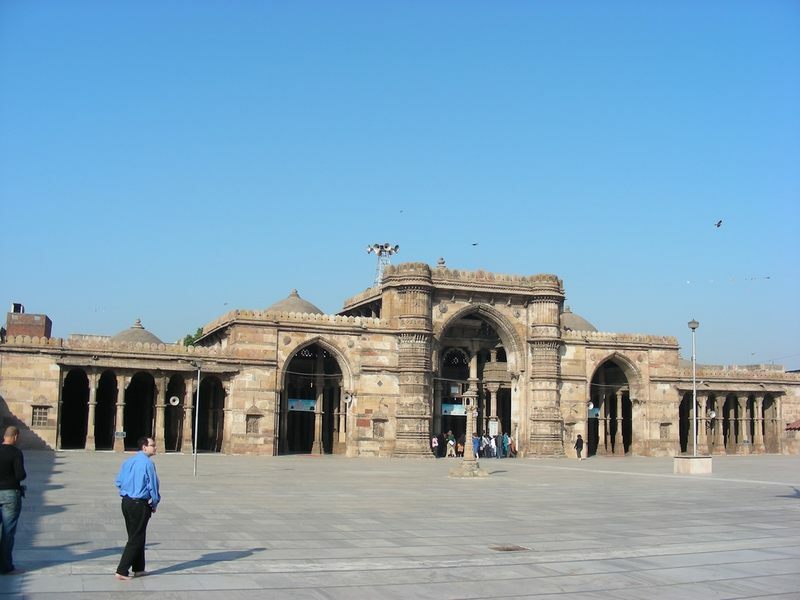 It is one of the finest mosques in Ahmedabad. 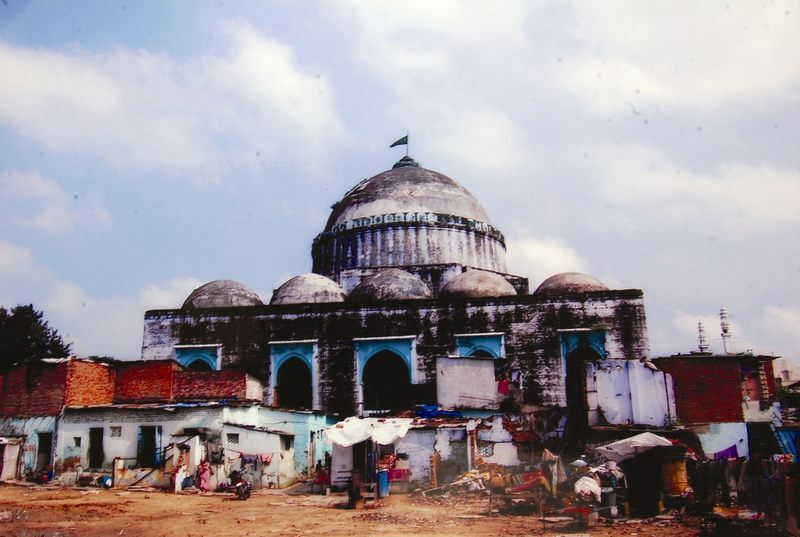 This mosque is situated in Mirzapur. It is opposite to St.Xaviers High School. 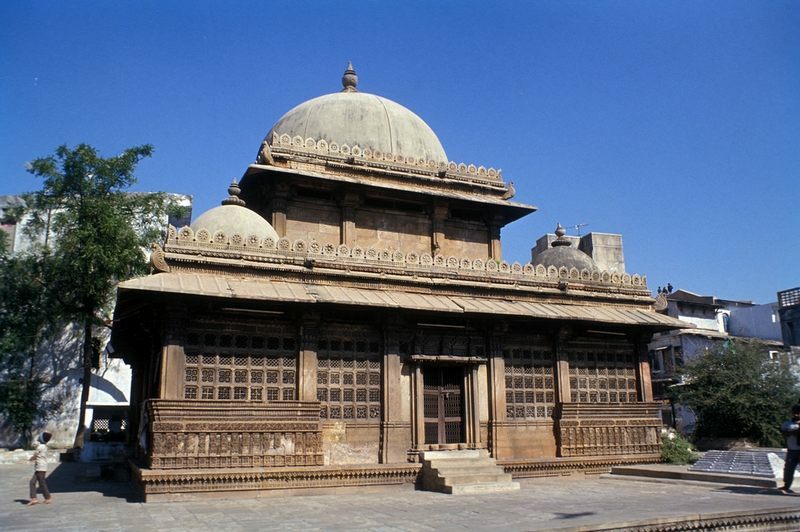 As the name suggests, it is one of the most beautiful mosques of Ahmedabad. Its minarets were damaged in the earthquake of 1819. Rani Rupmati was begum of Qutbuddin. After the death of Qutbuddin, his step brother Muhammad Begada married Rani Rupmati. In the construction of the mosque we find blend of Hindu style and Islamic style in pillars and arches. 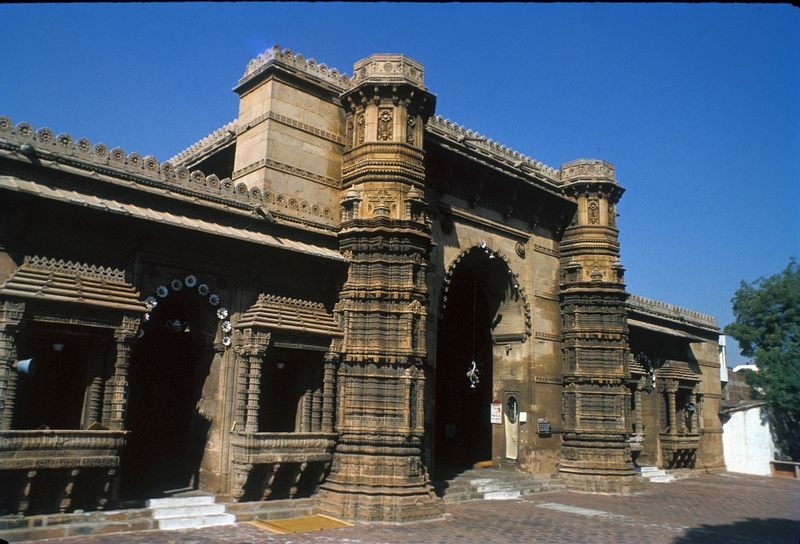 Sidi Saiyed-ni-Jali is a unique feature of Ahmedabad. 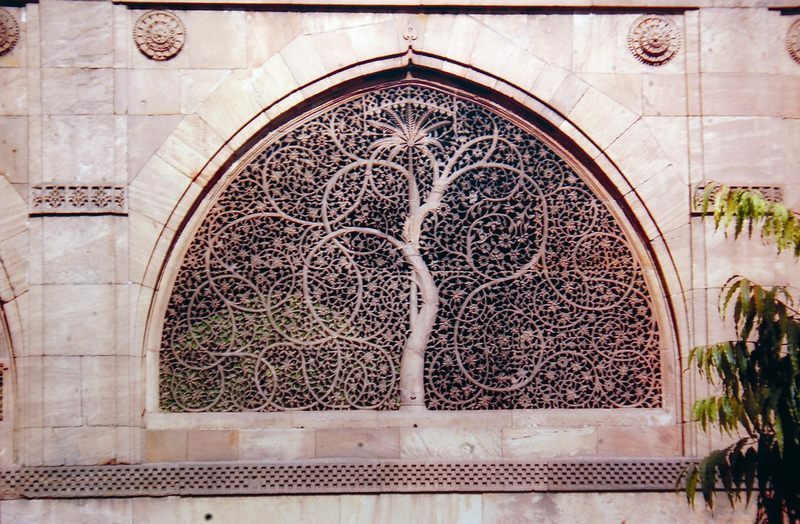 It is found in Sidi Saiyed Mosque, opposite Electricity House, near Lal Darwaja. This elegant mosque was built by Sidi Saiyed in 1573. The Jalis are in rear wall of the mosque. The Jalis have fine carving design in geometrical and interwined tree and foliage, palm and parasite motif. Such Jalis are found no where in the entire world. Numerous visitors have admired the carving of the Jali is generously. A silver replica of this Jali is available in the market. It is used as a gift to the guests and visitors as memory of their visit. The Shaking Minarets, the wonders of the city, are situated near water tank of Sarangpur Darwaja on the eastern side of new reservation office of Ahmedabad Railway station. The peculiarity of these minarets is that if you shake one minaret, the other one will also begin to shake automatically. The reaction of the movement of one minaret is received by the other one. These minarets are parts of the mosque, which was built by Sidi Bashir in 1452. The mosque was badly damaged during the battle between Marathas and Javanmardhkhan Babi, but the minarets were saved. At present, the entry to minarets is forbidden on precautionary notes. Other two minarets at the Railway Station are in better conditions and they are perhaps the tallest in Ahmedabad. Jami Mosque is situated in the middle of the city close to the east of Teen Darwaja popularly known as Jama Masjid. Sultan Ahmed Shah started its construction in 1412 and finished it in 1424. It can be compared with the Jama Mosque of Delhi. It has 707 pillars including inside pillars and those in the veranda. On both sides of the wall of minaret, there are beautiful recesses with attractive carvings. The atmosphere of the mosque is conducive for worship of the Allah (Lord). Dariakhan�s tomb, popularly known as Ghummat, is entirely built with bricks having tapering walls of nine feet width. It has arches and domes. Its central dome is said to be the largest of its kind in Gujarat, having excellent monumental value. The Naubat-Khana (Drum-room) is above the entrance of Badshah�s Tomb. 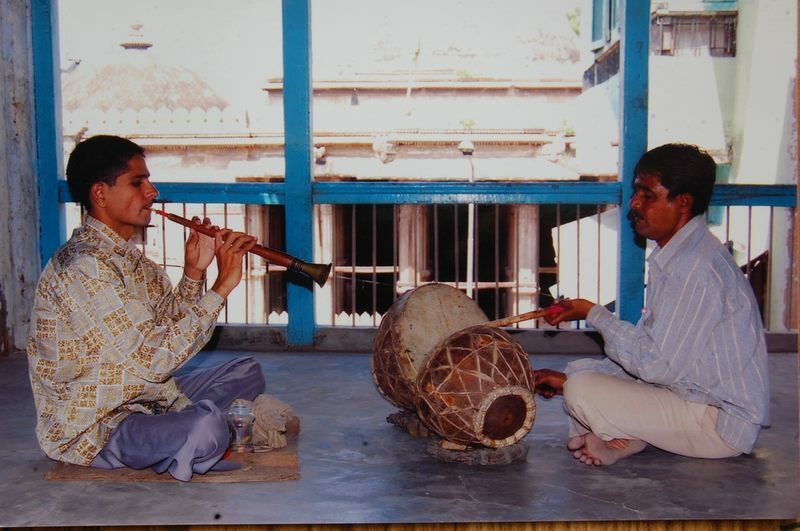 At present, Chherubhai, Amirbhai and Nanabhai- three sons of Banubhai are performing Naubat musics for 15 minutes 3 to 5 times over 10th generation. This tradition has been continuing since the establishment of the city. At present, Naubat is performed in the memory of Ahmed Shah as a Pir. Ahmed Shah�s Roja is popularly known as �Badshah-no-Hajiro�. It was constructed in 1446. The chief gate of the mosque falls in Manek Chowk. One can enter into the Roja by coming out from the eastern gate of Jami Mosque. The marble tomb of Ahmed Shah Badshah is centrally located. Besides it, there are tombs of his son Muhammad Shah and his grandson Qutbuddin Ahmed Shah III also that were buried in this Roja. 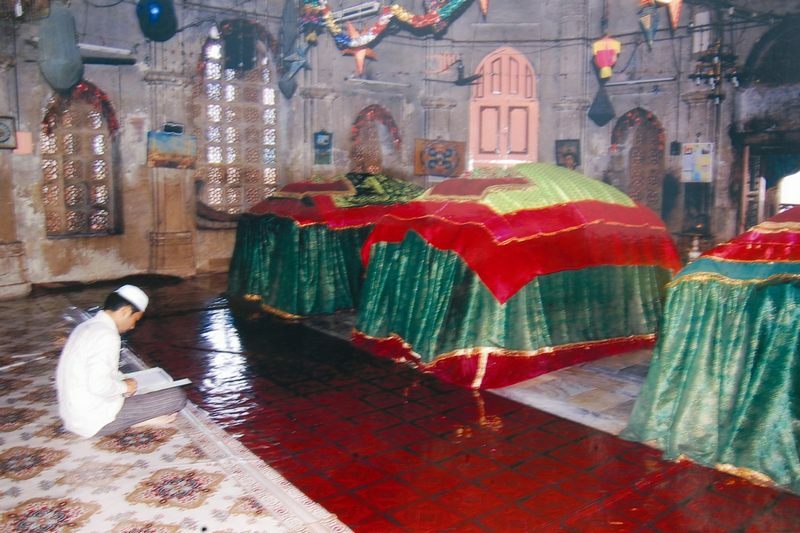 The Roja of Ahmed Shah�s begum is in Manekchawk known as �Rani-no-Hajiro�. In its wide chowk, three beautiful tombs of white marble are constructed. These tombs are of Ahmed Shah�s begum Mugalbibi, Hazarat Shah Alam�s begum Muglibibi and Hazarat Sayedali-Miradatar�s begum Miskibibi. The beauty of this Hajira is exhibited in its Jalis. The area surrounding Rani-no-Hajiro is now covered with big and small shops. Saint Shekh Ahmed Khattu Ganjbaksh, the preceptor of Sultan Ahmed Shah belonged to Sarkhej. When he passed away, Sultan Muhammad Shah started building his Roja in 1446 and Sultan Qutbuddin completed it in 1451. The mosque was also built during that time. Sultan Muhammad Begda liked this place very much. He made his Shrine just opposite to Ahmed Khattu�s Roja and had constructed a lake beside it. He built palaces for self and his family on the south east of the lake. The pillars of those palaces still exist. Saint Ahmed Khattu�s Roja is considered as the biggest Roja in Gujarat. The brass engraving of the Roja is worth seeing. There is an open pavilion with 16 pillars in Hindu style just opposite to the Roja. There is an inscription on the main Roja which states : �The whole world respects this saint�. Great architect Le Corbusier compared Sarkhej Roja complex to the Acropolis. Muhammad Begada had very close relation with Hazart Shah Alam, son of Qutub-ul-Alam, the Pir of Vatva. Shah Alam married to Bibi Mushki, daughter of the Jam of Sindh. His Roja was constructed by Tajakhan Narpali in 1475. This area is now known as Shah Alam. It is a very big complex. There are seven tombs in the south of Roja. 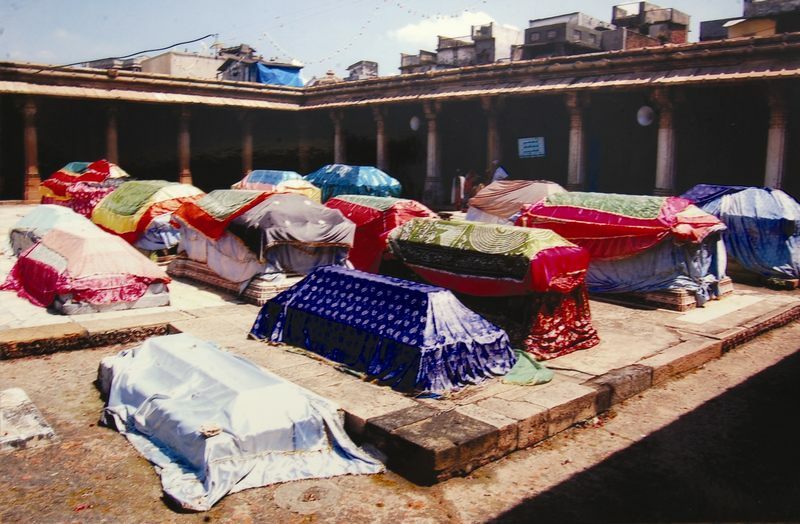 These tombs are of Shah Alam Saheb�s sons and grandsons. There is a small tomb of a parrot. Shah-Alam Urs, a fair, is held here in Islamic month of Jamadi-ul-Akhar. Kankaria - the attraction of Ahmedabad, is a historical lake. According to history, Karnadev Solanki had built a lake called �Karna Sagar� in Karnavati later became Kankaria. A large quantity of pebbles (Kankario) was observed while constructing the lake and so it was named as Kankaria. It is believed that it was renovated by Sultan Qutbuddin in 1451 in the presence of his father. Sultan Qutbuddin must have named it as �Hauz-e-Qutb�. Kankaria lake covers about 76-acre land. It has 34 equal sides of 190 feet size each. This Lake is regarded as one of the biggest town lakes in the country. In the middle of the lake, there is �Naginawadi�. It is well linked with the bank of the lake with a bridge. The culvert and duct provided in the lake are the best specimens of Hindu workmanship. At present, the surrounding of this lake is developed very efficiently under Kankaria Lakefront Development Project. 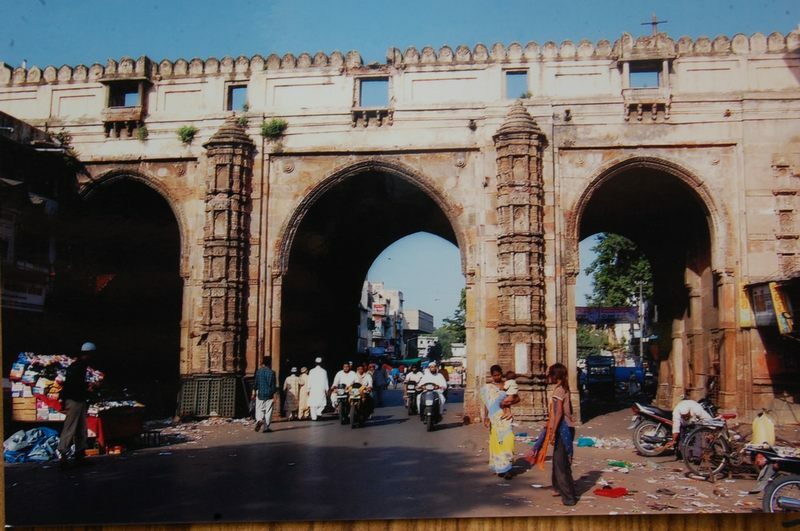 Three Gates is a royal entrance to the city, popularly known as Teen Darwaja. The middle arch is 17.5 feet wide that even the municipal bus can easily pass through it. Arches on both the sides are 13 feet wide. At present, people use it as one way. Its height is 25 feets. There are small arches through which one can go from one gate to the other. On the east and west of the middle gate there are small recesses with carvings and also small towers with carvings as we find them in the mosque. There is a terrace over it. On both the sides, there are three balconies. There was a roof over the gates formerly, which was removed in 1877. At present, the terrace is open. The Royal residence, the fort of Bhadra have eight gates. In order to maintain safety, Muhammad Begada had constructed a wall around the city in 1486. The young generation of our times will not have the idea about it because the wall is damaged and it has vanished at certain places. 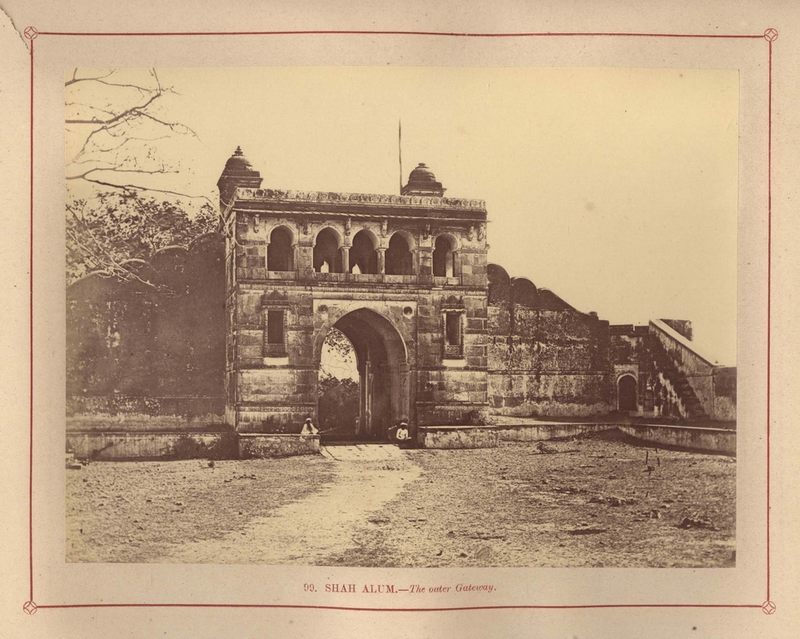 The original fort had 12 Gates, namely Ganeshbari, Raikhad, Astodia, Jamalpur, Khanjahan, Raipur, Sarangpur, Kalupur, Dariapur, Delhi, Shahpur, and Khanpur Darwajas. Besides these, the three gates - Teen Darwaja near Karanj in the middle of the city is worth mentioning. The Shahpur Darwaja is demolished as it obstructed the development of the city. The fort had small window-doors besides the gates. Even today, such window-doors are seen on both the sides of Delhi Darwaja. There was a window-door between Shahpur and Delhi Darwaja known as Halim-ni-Khidki. In the same way, there was a small door called �Mahudha� between Astodia and Jamalpur Darwaja. The fort was destroyed in the floods of 1755. The British army destroyed the fort wall near Raikhad Darwaja in 1780. Collector Bordel repaired the fort in 1832. After that, the authorities removed the portions of the Fort-wall at many places to add to the public facility. Now we can see rows of shops in place of the fort-wall from Kalupur Darwaja to Delhi Darwaja via Dariyapur Darwaja. There is a row of shops known as �Kot-ni-rang� from Sarangpur to Raipur Darwaja. With the advent of Railway, two more gates were added to make provision for entrance. These two gates are Prem Darwaja (1864) and Panchkuwa Darwaja (1868). Thus the number of gates in the city are 16. The fort-wall around the city is five miles long. There were 169 Burjs in it. Each Burj was 15 feet tall and 5 feet wide. There were holes in these towers and the fort had a border at the top. A big structure in the east of Bhadra fort, beside Bhadrakali temple is known as Azamkhan�s Palace. Azamkhan was governor in 1635, during the Mughal period who built this palace in 1637. Its main gate has Iranian style. 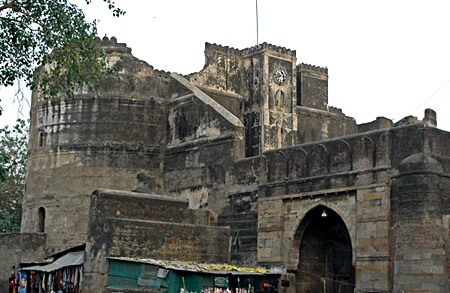 Because of the vast compound and the grand gateway, this building appears to be unique.The military officials used to stay here during Maratha period. During British period, it was converted into prison. At present, it is used as court-building and department of Government publication. 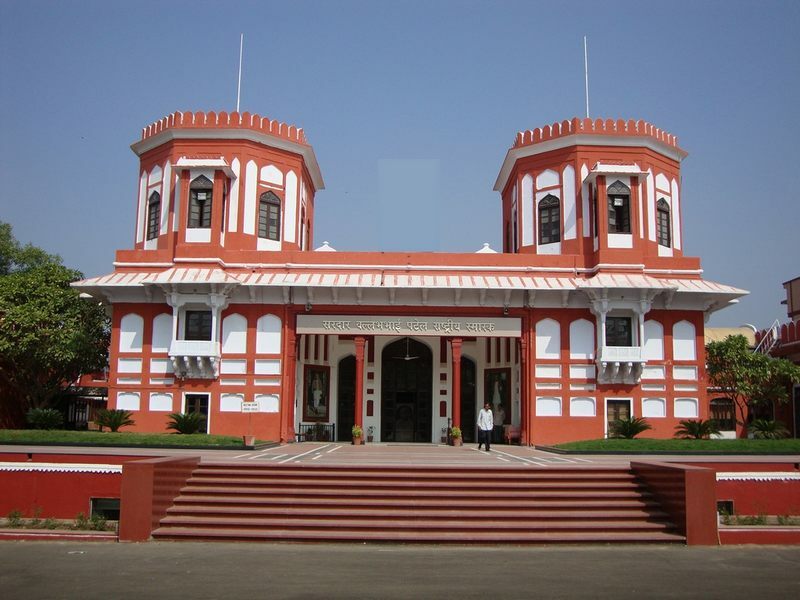 The palace situated in Shahibaug and popularly known as Shahibaug Palace is infact Motishahi Mahal. During the time of Shah Jahan in 1621-22, severe famine was observed here. He built this Motishahi Mahel with a view to provide livelihood to the people suffering from scarcity during the famine. It is said that Badshah Shah Jahan was to take royal visit to the palace. Badshah was on the elephant�s back but the arch of the entrance was low. So he could not enter the palace and turned his back on it. The Badshah did not spend a single day or entered into the palace, which he had constructed. 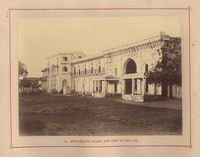 When Ahmedabad became capital of Gujarat, this historical building began to be used as the official residence, Rajbhavan of the Governor. 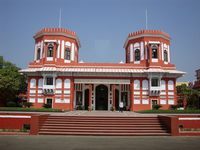 At present Motishahi Mahel is used as �Sardar Vallabhbhai Patel National Memorial Museum�.